Private sittings and Coaching - also via SKYPE! Ria Hennink is active as spiritual medium, artist and author. Husband Hans Vet works as spiritual healer. They are both from Dutch origin, but live in Switzerland. Within the framework of the TOURMALINE School that was initiated by Ria in 2011, they give lectures about spiritual themes and organize courses and workshops in spiritual development: mediumship, sensitivity & healing. The workshops often contain working with art and colours, that have an important role in the spiritual world and work. Hans and Ria both give private sittings, healing sessions and coaching. Ria draws portraits of those who live in the spirit world who make themselves known during her sittings or public demonstrations. Ria has studied Arabic language and literature at Leyden University. She worked as a consultant in the Middle East and back in the Netherlands as free lance translator. In Switzerland she has been working many years as cultural attaché of the Netherlands Embassy in Berne. Hans studied Architecture at the Delft Technical University and Business Administration at the Erasmus University in Rotterdam. He worked for the United Nations and the Dutch Ministry of International Development in Sana'a (Jemen). After returning to the Netherlands he set up his architecture office. In the nineties Hans started working as an architect for the Goetheanum in Dornach, Switzerland, which became the start of their Swiss life. After running a contemplation center in the Swiss mountains, House Parzival, for a period of 13 years they now fully concentrate on their spiritual work. Hans' and Ria's spiritual background is the work of Rudolf Steiner: the Austrian philosopher, who initiated the Waldorf Pedagogy, Biodynamic Agriculture, Anthroposophical Medicine and the arts Eurithmy and Creative Speech. At the beginning of the twentieth century Steiner founded the High School for Spiritual Science - the center of Anthroposophy - in Dornach. Many so called Work Fields, like schools, biodynamic agriculture, eurithmy school etc. exist world wide. 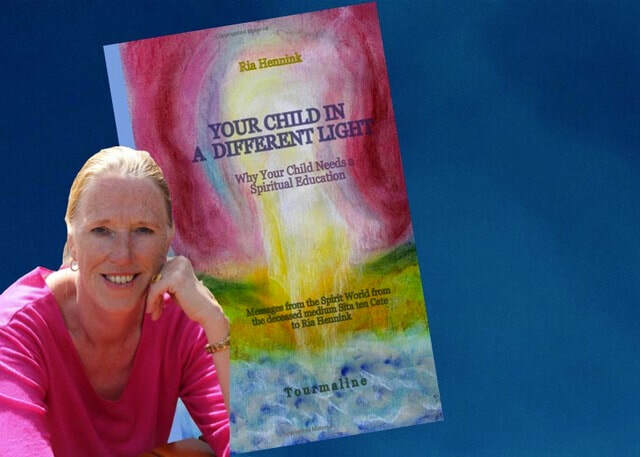 "YOUR CHILD IN A DIFFERENT LIGHT"
Two years after her passing in 2012 Ria's friend Sita ten Cate gave messages, that have been published in 2016: "Uw kind in een ander licht" (Your child in a different light) and "Reizen naar de Hemel" (Journey to Heaven). The English version of "Journey to heaven" will appear in 2019 as well as the German translation of "Your Child in a Different Light". A Circle for THUN is being planned.